Technologies of Religion, by Sam Han of the Nanyang Technological University in Singapore, offers both more and less than the description from its publisher would appear to indicate. Its main impact is as a work of critical social theory, and specifically concerning the cosmogonical, or ‘world-making’ qualities of contemporary religion as it meets new (and in particular, digital) technologies. 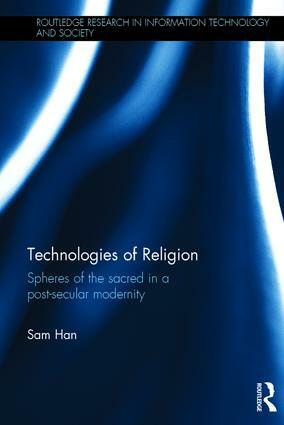 Han is concerned to show that new technologies and religion come together to form ‘spheres’ (or ‘worlds’), that no longer correspond to the categories of the classical sociology of religion as associated with Durkheim or Max Weber. Gone is much of the stability and hierarchical longevity associated with authoritative institutions; Han’s spheres are in constant flux, unbounded, networked. These ‘modular assemblages’ have a kind of promiscuity, as different worlds or spheres form network connections with others, across which certain elements (traditionally separate) may ‘resonate’ according to their ‘affinities’ (p.30). In a short review it is difficult to fully sum up Han’s theoretical argument, developed stage by stage in close dialogue with philosophers, aestheticians and sociologists and occupying very nearly half of the book’s 113 pages of text. (Particular attention is paid to Peter Berger, Mircea Eliade and John Milbank amongst others). Perhaps of most interest to readers of this journal, and historians of religion more generally, is Han’s engagement with recent readings of Max Weber, and with classic secularisation theory more generally. Students of secularisation have often tended to understand ‘religion’ and ‘technology’ as antipathetic: that the growth of new technologies, along with modernisation in general, has in general acted as a solvent of traditional religious belief and the organisations which support it; an assumption which has often been carried over into scholarship on religion and the Internet. Han wants to show that the two, far from being antipathetic, in fact exist in a relationship of mutual support which is ‘ontologically creative’ (p.31). Scholars of religion and the Web have in recent years themselves moved away from such an oppositional model of the religion/technology relationship, and have begun to unpick the ways in which religion and the Web mutually influence each other; Han’s work provides a welcome boost to that process. Chapters 3 and 4 are an examination of some of the theoretical themes worked out in relation to Bright Church, a large ‘multi-site’ evangelical church which operates on several ‘campuses’ in the United States. Here Han seeks to show that the multi-site model of church – in which a single preacher’s message is simultaneously videocast to each campus – places traditional ideas of religious space into play in a new way. Han also examines the ways in which the presence of technological objects in the worship space may be read as constitutive of the message being conveyed. Chapter 4, examining both Bright Church’s own graphical user interface and its use of Facebook, is concerned with the nature of religious communality. It is in these two chapters where the weaknesses of the book show most clearly. Although it is not Han’s main concern that it should be otherwise, his thesis of the ontologically creative nature of religion and technology is curiously ahistorical. This is a shame, since a greater engagement with the history of religion and the media has potential to strengthen his case. His reading of the design of the worship space and the technological fixtures and fittings within it is suggestive, but it could have benefitted from a greater consideration of the means by which earlier ‘technologies of religion’ – candles, music, paintings and sculpture, priestly vestments, liturgical vessels, and the movements of people and objects – have created the ‘atmosphere’ that he analyses in terms of projector screens and mixing desks. Similarly, the book’s analysis of the means by which identification is created between a worshipper and a physically distant preacher would bear some juxtaposition with scholarship on religious broadcasting on radio and television and its reception, or on the circulation of recordings of worship music from ‘celebrity’ worship leaders for use in the home. More generally, this reader was left with the impression that, whilst Han’s theoretical framework may well be a fruitful one, it is by no means established from the empirical data presented, which is thin. Han focusses on Bright Church alone, which raises the question of how typical it may be of other churches, Christian or otherwise, with multi-site operations. Only some twelve pages of documentation of Bright Church are given, in which small space is included an observation of the worship at one of its several campuses as well as readings of associated Christian technological literature, and of the online church interface; Facebook is given a single page. Han asserts (p.62) that the experience presented at Bright Church New York may safely be taken as typical. Whilst clearly true of the presentation (since it is controlled from a Global Operations Center in Oklahoma), the experience is surely modified by the physical size and shape of the room, the number of people present, as well as by the use of local musicians. There is also little discussion here of the perceptions of the worshippers themselves, either those present in person in New York or engaging with Bright Church online, and also relatively little from those responsible for its leadership. A much deeper and wider empirical engagement would be needed to ground Han’s theoretical work than is on offer here. These cavils aside, Han’s study presents many fertile lines of enquiry for historians of religion and the Web. It is well written, although it is often dense and heavy in its use of jargon terms and will tax those without a close acquaintance with the theoretical work with which it is in dialogue. At £90 for only 129 pages it may stretch some budgets, but once in hand it will repay attentive reading. I’m a great fan of Studies as a series, and have indeed published four articles in the series myself. Partly dependent on the theme that is chosen, the number of articles on the twentieth century very much varies from year to year, and this year is a lean one. Volume 51 last year had no fewer than ten articles on the twentieth century; this year there is just the one: Kirstie Blair on the religious sonnet in the nineteenth and twentieth century, including the poets Geoffrey Hill and Carol Ann Duffy. This is not to criticise the Society: they may of course only publish the articles that are offered. But I wonder why it is that the theme of doubt seems to have exercised scholars of the twentieth century so little, given the scholarly energy expended on questions of secularisation. (i) Andrew Atherstone’s piece on Raymond Johnston, leading light of the Nationwide Festival of Light. Johnston is something of a heroic figure amongst some parts of the evangelical community in the UK (see this paper by David Holloway). It is very good to see Johnston, and the NFOL, getting scholarly attention. (See also this on the NFOL by Amy Whipple. (ii) Callum G. Brown on the oral history of women leaving religion. Brown shows that the terms in which these journeys away from the churches are narrated are heavily gendered. It can be read very much as the companion piece to his essay in Lucy Delap and Sue Morgan’s recent collection on men, masculinities and religion.